To say we had been a bit apprehensive about crossing into Albania would be an understatement. 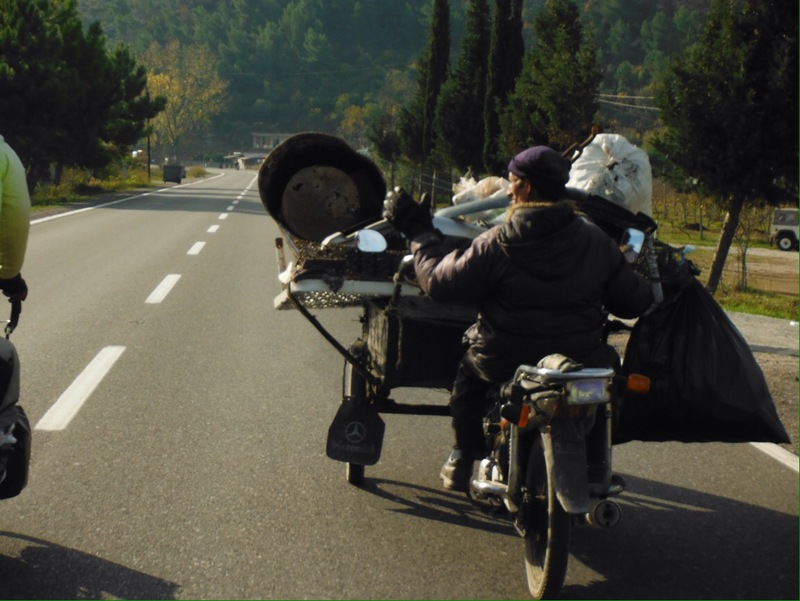 All cycling blogs about the country read the same: fast and reckless driving, busy roads in poor condition, litter everywhere, dog chases… Anyone that we mentioned our plans to cycle there to responded with the same worried look. The first evening in Shkoder began with confusion and ended with a very large pizza. Firstly, it did not seem to be essential to go anti clockwise around roundabouts, for cars or bikes. If you need the last exit, just turn left, it will probably be ok. Additionally cyclists should not feel constrained by the standard procedure to ride on the right. Either side is fine. Next, the hostel we had booked was actually closed for a public holiday (low traffic volume now making more sense), we spoke to a trainee priest outside about cycling and went on a hunt for somewhere to sleep. We rode into the well-kept centre, noticeably cleaned up for the national holiday – there was lots of litter everywhere else. Albanians strolled around and we settled on a sports bar called Liverpool for a drink to aid our search. I’m not sure a woman has ever been in the Liverpool sports bar, Shkoder. Time stopped when I entered, even the keenest Bundesliga betters stared at the weird English girl. Or maybe it was the cycling kit. By the time Jo had locked the bikes I had ordered coffee, fizzy pop and we even had a table to go with the strange looks. Finding a hotel was just as easy and the pizza even had some vegetables on. At least 1 of our 5 a day anyway. 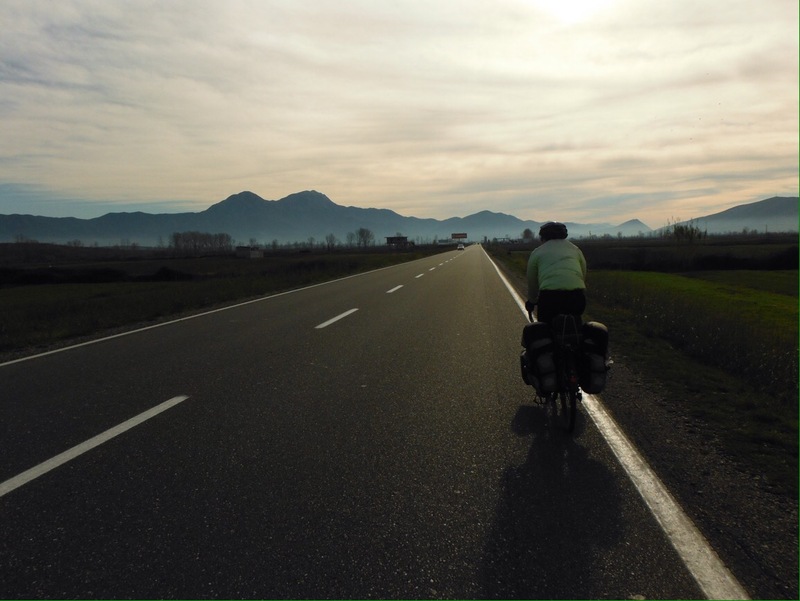 We found our way out of Shkoder via a great bread shop following a man who was carrying cement bags on the back of his bike. We even went the right way around the roundabout. It seemed Albania was still recovering from the holiday weekend excess as there was hardly any traffic and, for the first time this trip, a killer tailwind. We had ridden almost fifty miles by 1pm, and had managed a coffee stop, a picnic lunch and two rounds of lovely people giving us fruit we didn’t know the name of. One of these stops we had to stop them from filling a third carrier bag as we just didn’t have room to carry any more! The fruit is kaki, maybe called persimmon at home? In season and everywhere. 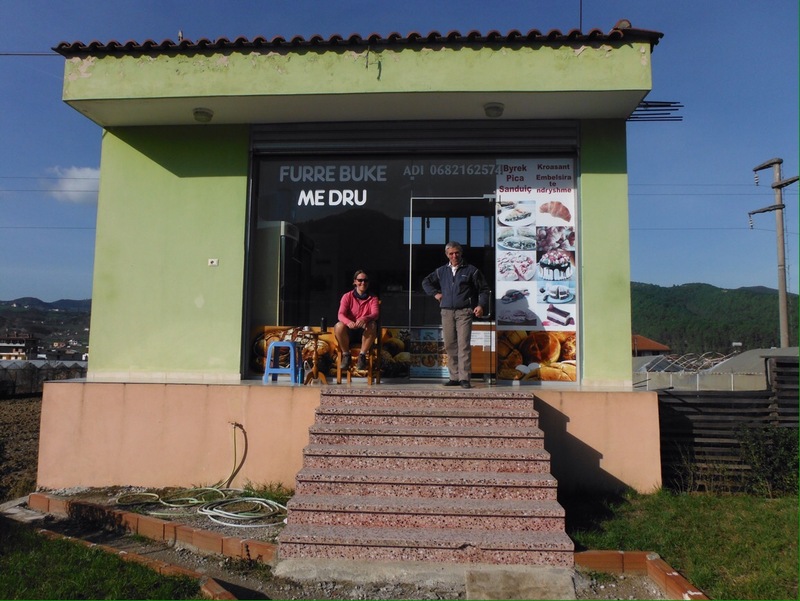 Our rapid progress was unsustainable – we had left the highway where it became a motorway (following a sign for Kosovo, not something you think will ever happen), and although the detour was initially on an ok road this did not last. Once we had passed the last car wash in the town the road really deteriorated. In Albania if there is no petrol station and/or car wash every 500m a road just isn’t worth travelling on. This road was on our map, and looked to be a reasonable one, it had a number. It also had a lake. There had been many potholes and puddles, but this the whole road and some of the land either side. Handily, and enterprising local had put stepping stones along one side. We stepped but the bikes had to wheel through, and.were very grubby by the end. First 80km – 4 hours, next 8km – nearly 2. Finally we rejoined a sealed road and began the climb to Kruje, a town in the mountains with a castle that we would be staying in. It was a 600m climb and even though the wind had helped us earlier the last few kilometres of 110 were a struggle. Castles here (and in Croatia and Italy) are not one big building, more castle outer walls with several smaller buildings inside. The view was amazing and we visited the very single minded museum of Skanderbeg the next day. You name it, they had it. Portraits, busts, diaries, poems, photos of statues of him in other countries, places with streets named after him, books where he might be briefly mentioned (Albania travel guide in German). That wasn’t even the best thing though. We were the only visitors at the museum that early, or maybe that day, and we were outnumbered by the staff 4:1. One guy took our money, one lady had a feather duster (an actual one), one gardener, and one security guard – presumably for the crowds. What the other four could possibly have been doing is a total mystery. Admiring the view from the majestic balcony? Playing bows and arrows with the fine selection of cross bows in the upstairs corridor? #communism hangover. Sad to see lots of litter, many places with much more than this. Just like everyone says, Tirana had some colourful buildings, and impressively (surprisingly?) a march for World AIDS day made up of young people. It also had enough takeaways to satisfy our sudden chip craving, a piece of the Berlin Wall (‘what’s that graffiti?’ Jo), a massive statue of Skanderbeg on a horse and a water fountain shaped like an Arabian tea pot. We enjoyed seeing the innovative way a huge pothole near the Department for Transport and Infrastructure had been repaired. A palette over the top and hazard tape around the edge. This must have been official procedure as we saw this several times by uncovered drains. Getting out of Tirana was easier than getting in, and to celebrate we ate three cheese pastry things sitting on the kerb outside a great bakery. When the owners saw us sitting there, they asked us to come over and got chairs and a small side table for us from their house. When we asked if they had coffee, we were given theirs that had just been brought over by someone from the cafe next door in some sort of bread/coffee exchange. They would not accept any payment for the coffee and stood with us in the sunshine while we enjoyed the baked goods. We didn’t get far before we saw a football match going on at a pro-looking mini stadium. It was an age group academy game and was a good standard. There was a lot of spectators and in jumbled Italian we established what the score was and ordered some drinks. We also spent a penny in the most surprising toilets of the trip. Imagine standard football women’s toilets. 5 sinks on one wall, 5 cubicles opposite. Now remove the cubicle partitions. Yep, team peeing here. Weird, especially as they were finished to a very high standard, probably the nicest toilets in Albania. 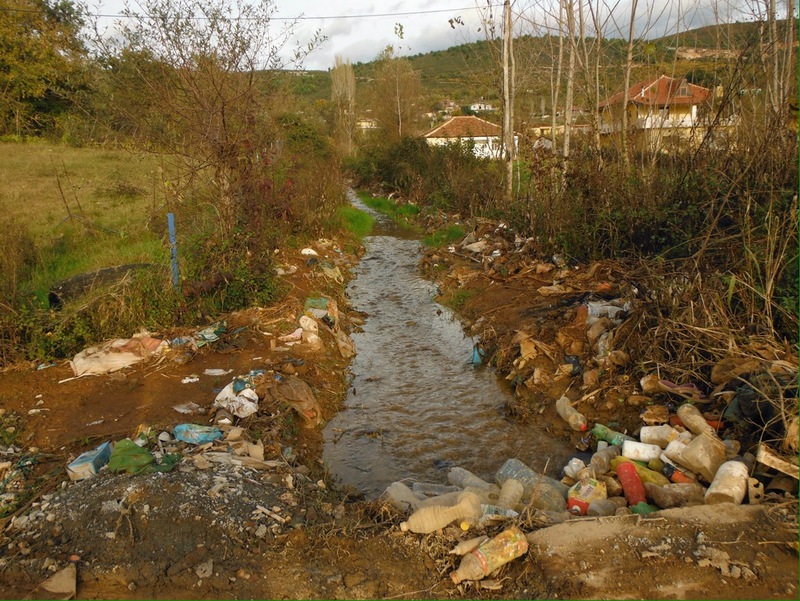 Whilst in Tirana we had received a message about a Christmas work-stay we had applied to. This meant that instead of going to Greece we were heading back to Italy for a Tuscan Christmas. 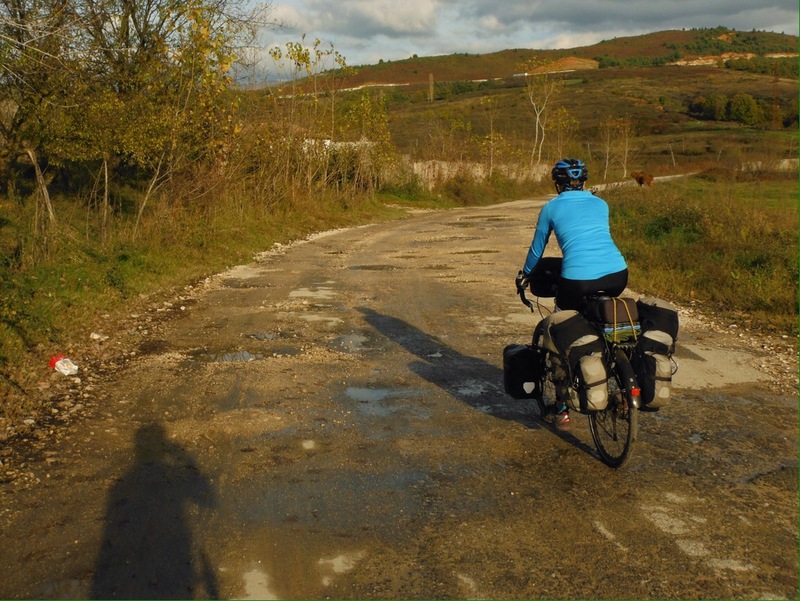 Sadly we decided that there were not enough days to ride all through Albania before getting a ferry to Italy. Instead we re-routed to Durres and had another chip stop to commiserate. We also found a great Souvlaki and our first Christmas tree. We would never had anticipated being sad to leave Albania. It was really fun, helped by the friendly people and the great weather! Not a place to try to get around quickly though, or have a relaxing mini break. You are probably thinking that we must have been so mentally scarred by the vicious dog chases to write about them. I guess the mean dogs must hibernate in winter, or move to Montenegro for the skiing. Dogs barely looked at us, let alone bark or chase. We had to cycle around one that was napping in the hard shoulder. 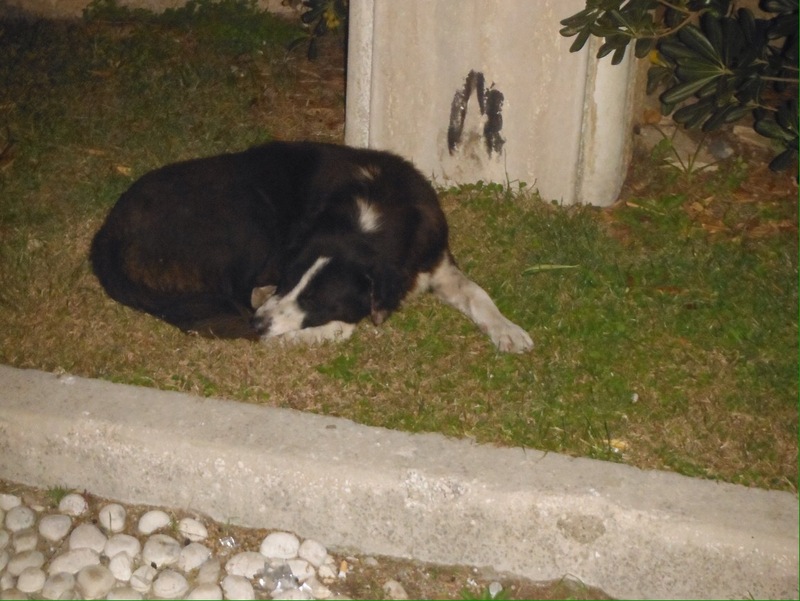 Dogs of Albania, not scary.